Images of starving children have once again turned the attention of the international community to Africa. Food shortages have left more than 2.5 million people in need of food aid in Niger, where over 20 percent of the population is suffering life-threatening malnutrition. Niger’s western neighbor, Mali, is facing similar food shortages, with as many as 2.2 million hungry by UN estimates. Mauritania has also been affected. The current famine throughout western Africa is a result of drought and locusts decimating crops in 2004. The seeds of famine were evident in satellite imagery acquired in July 2004. 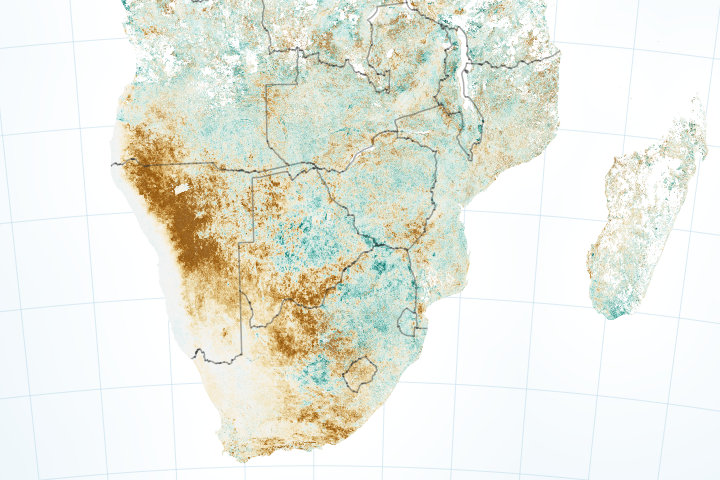 Streaks of brown in the top image reveal where drought thinned crops across the western Sahel. The image is a vegetation anomaly [normalized difference vegetation index (NDVI) anomaly] image, created from data collected by the SPOT Vegetation satellite. Vegetation anomaly is a measure of the density of vegetation compared to long-term average conditions. In regions where vegetation is less dense than normal, the image is brown, while better-than-normal conditions are represented with green. 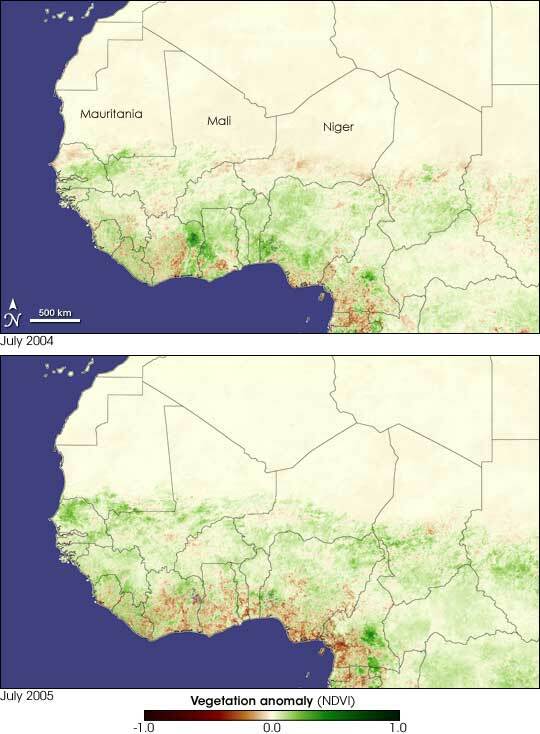 The strip of brown in the top image shows that in July 2004, drought had thinned vegetation in the southern half of Niger, its prime agricultural and pastoral zone. Northern Niger is covered with non-arable desert land. Patches of yellow and flecks of green show regions not as severely affected by drought, but an infestation of locusts destroyed crops and pasture land in these regions all the same. By contrast, in July 2005 (lower image), vegetation is much denser than normal. A good rainy season is revitalizing both agriculture and native plants. Welcome though the rain is, it triggered deadly floods where it fell on hard, sun-baked ground that has been stripped of vegetation by starving animals and people. The 2004 image is a good example of how satellite data can provide an early warning of developing famine. 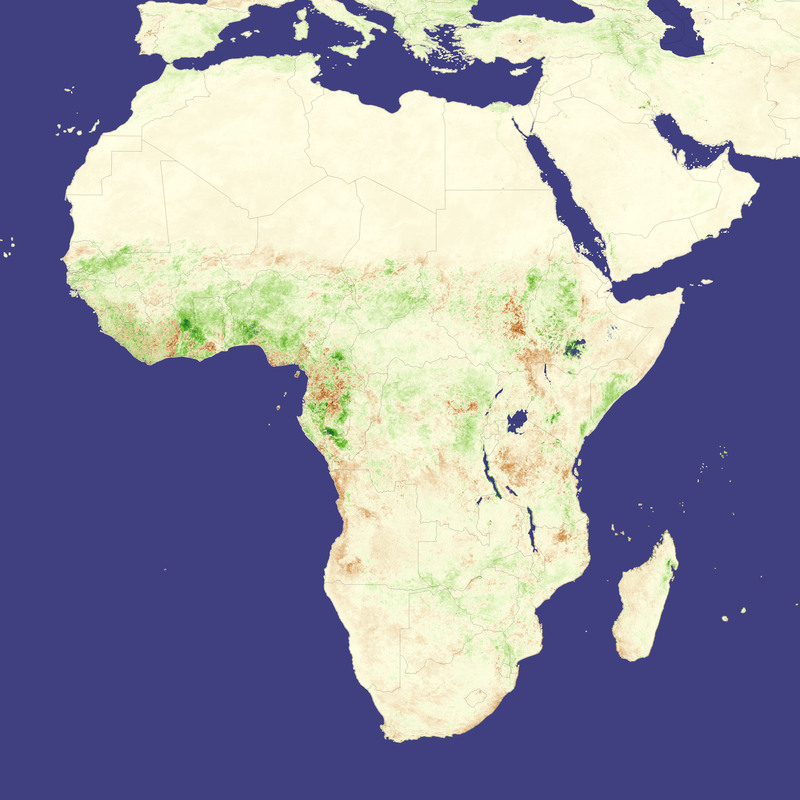 Organizations like the Famine Early Warning Systems Network (FEWS Net), sponsored by USAID, use such imagery to see where vegetation is failing before the crops are harvested and food becomes scarce. By combining this information with other data, like rainfall measurements, land use data (what grows where), and human factors like market conditions and population distribution, FEWS Net can forecast where famine may develop and sound a warning. The early warning gives aid agencies a few extra months to mobilize resources and food supplies needed to provide relief before wide-spread starvation sets in. The World Food Programme began to respond to Niger’s food shortage in November 2005, but reports that funds were insufficient to completely stave off the famine. To read more about the use of satellite data to monitor the famine in Niger, see the Famine Early Warning Systems Network web site. To learn about the international response to the famine or to find out how you can help, see the United Nations World Food Programme web site. These images are a composite of data collected by the SPOT Vegetation satellite and were generated at NASA Goddard Space Flight Center by the GIMMS Group under analysis agreement with USDA Foreign Agricultural Service.as part of its Global Agricultural Monitoring activities.